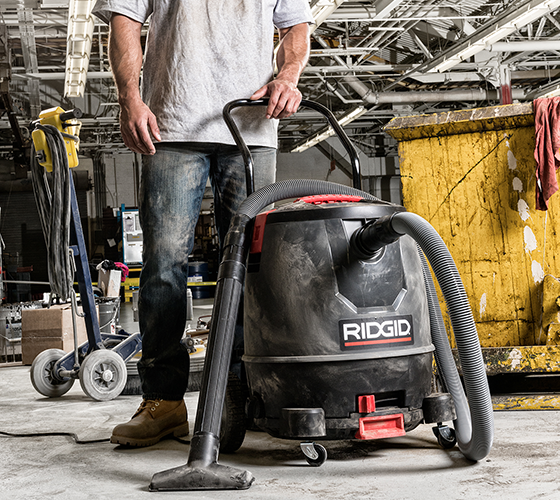 RIDGID® Wet/Dry Vacs are designed and engineered for best-in-class power, performance and durability. RIDGID shop vacuums are also backed by the best warranty in the industry. Powerful. Durable. Professional. RIDGID is the Wet/Dry Vac leader with an unwavering commitment to superior performance, technology and quality. With long-lasting construction and thoughtful on-board storage, RIDGID is the go-to choice for any clean-up. RIDGID Wet/Dry Vacs are built to last and come standard with the best warranty in the industry - the RIDGID Full Lifetime Warranty against defects in workmanship and material. Contractor-grade shop vacuums with the top-of-the-line performance and durability required by contractors and DIYers. These wet/dry vacuums are conveniently available at The Home Depot®. Professional Industrial-grade shop vacuums developed specifically for commercial, facility, and professional use. These wet/dry vacuums are offered through industrial distribution. Learn more about the shop vacuum tools, accessories, and nozzles to maximize the versatility of your vacuum, as well as available wet/dry vacuum filters to capture and filter debris. These rugged air movers are ideal for ventilation, drying floors, carpets or any water damaged areas. Tackle even larger areas with our daisy chain enabled models.